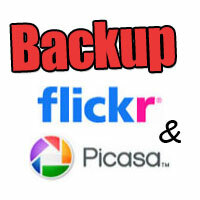 Ever thought of backing up images of your Flickr or Picasa web albums? Many times you may have lost your data on computer due to your system crash. It is possible that Yahoo or Google would delete your account due to any reason.. Shouldn't you take a backup of your precious memories? I have more than 1000 images in Picasa & Flickr albums, I take backup of them regularly. I tried various software and services. But I liked one most - Indyarocks. Indyrocks is an Indian social networking & blogging site. You can also send free SMS from PC to mobile via Indyrocks, it's another advantage of using Indyrocks. Continue reading for step by step process on backing up the pictures. 1. Login to your Indyrocks account, if you don't have an account in Indyarocks then create one. 2. 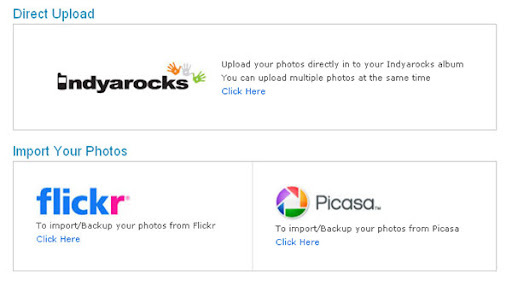 Now you will actually import your images to your Indyarocks photo album. 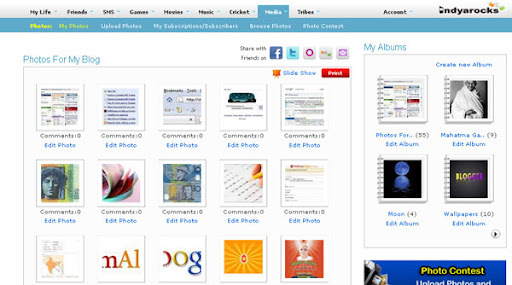 [http://www.indyarocks.com/photos/photos.php] Now can choose to directly upload to Indyrocks or import photos from Flickr or Picasa Web Albums. Then you will be redirected to an authorization page, enter your login username and password, don't worry it is safe. 3. Leave it for few minutes, It may take time depending on the no of images you have. When it finishes the file transfer, you can select other album too. All my images have been imported to my Indyrocks account, and they are stored in albums as they were in Flickr & Picasa albums. 4. If you add more photos to your Flickr or Picasa web albums, you should repeat the same process again. bots will add the new images to your Indyrocks album. 5. Privacy Setting : You can make your album private or public, so no worries about your privacy. How Is Indyrocks Better Than Other Migration/Backup Software? 1. The process of backing up is online in Indyrocks. Whereas in some other solutions you have got to download the images first, eating up your bandwidth. 2. Privacy : Indyarocks maintains your privacy. It's reported that some of the other backup services leak the images. So friends did you take a backup? Do you use Flickr, Picasa Web or Indyrocks? Do you know any other website/service which backup the images? Do share with us. How to Optimize Images for SEO? Nice tutorial for backing up of images :)will create backups. IndyaRocks is offering quite a useful service to backup images. I am glad that you liked. Yeah it's another great service from IndyaRocks. Hi, very great info. I like this game very much. Thanks a lot. checking if its a game ..lol.. 1st spam may be. Woah! Just heading up it. Is it provide unlimited or just for a while? @Anup I tried 3 times, did not see any limit yet.